Fincher has had great success in Hollywood. Se7en (1995) is an established genre classic and Zodiac (2007) is a cult classic, as is Fight Club (1999). Fincher has also brought us The Curious Case of Benjamin Button (2008), The Social Network (2010) and The Girl with the Dragon Tattoo (2011), all massive earners at the box office. 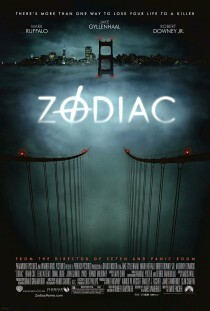 Zodiac is a mystery crime thriller based on the 1986 non-fiction book by Robert Graysmith. Graysmith was a political cartoonist at the San Francisco Chronicle during the Zodiac Killer’s reign of terror in northern California in the late 1960s and early 70s. Graysmith became obsessed with the case and spent more than a decade of his life following innumerable leads and clues in an attempt to find the serial killer’s identity. Fincher’s film follows Graysmith’s story as he initially works with press colleagues and official investigators, and subsequently tries single-handedly to break the case. Zodiac is a thrilling and fascinating portrait of a true-life investigation. The screenplay is impeccable, as is the direction and acting by Jake Gyllenhaal, Mark Ruffalo, Robert Downey, Jr. and others. It is one of the best made films of the last decade. Hi Max. Thanks for stopping by and taking the time to comment! Yes, I have Final Cut Pro X, so I should start playing with it a little more!! You’re so right: the colour filters are gorgeous and really set the right tone for the movie. I agree with you that the Swedish originals of the Millennium trilogy are great. I don’t understand why Fincher would want to remake a film and set it in the same country and almost mimic scene-by-scene the original. The same happened with Let The Right One In (2008) and Let Me In (2010). And Funny Games (1997)/(2007). Well, there are countless examples. The three remakes I’ve mentioned are at least well-made films. But it still seems like such a waste of time and money, in my opinion, and such a shame for the producers of the original films and the actors who play in them. Best not to get too fascinated! The first Dirty Harry movie gets slightly psychologically interesting with Scorpio. That’s right, Chris! The fictional ‘Scorpio’ character in Dirty Harry (1971) was based on the real and then ongoing Zodiac Killer case. Some elements such as the school bus threat were directly lifted from the real investigation. That freaked me out a bit as a kid. The film or the real deal? Oh I mean the film. I thankfully wasn’t around. Actually, though, we had the Nightstalker Richard Ramirez, and I remember a guy named James Huberty going into a McDonald’s and taking a lot of people out. The few serial killers who aren’t necessarily consumed by passion, desire, or their animal instincts are rare, and frightening, because I think they raise the possibility of genuine evil in our minds. I just read up on James Huberty. How strange what some people do when life doesn’t go their way. I’ve read a book on Richard Ramirez. He really was a sick individual. You could definitely label him evil, I think. But the most bizarre part of his story are the hundreds of women that threw themselves at him, writing him letters and sending presents, once he had been convicted. That’s incredibly weird. I’m with you on this one. Very accomplished, wonderfully crafted and pretty uncompromising too, i really like Zodiac. Good review! Actually, after writing this, I’m itching to see it yet again, Joe! I don’t think I can resist. I prefer to leave long periods – a year or two, at least – before rewatching a movie. This freshens things up again; you forget things; and it adds to the experience. But with this film it’s impossible. The soundtrack was also just so fitting. I don’t remember the soundtrack at all – even though I’ve watched the film several times. That to me is an indicator that music was used elegantly and sparingly. Am I right? I must concentrate on that aspect of the film next time I watch it. Thanks, Joe. By the way, I haven’t been through all your posts… Have you ever written a piece dedicated to your experiences as a projectionist? That would be awesome to read. Thanks for the recommendation! I’m a big fan of Fincher’s movies but have never seen this one! Hi there, Interopia. The images on your website are highly original and interesting. If you haven’t seen Zodiac yet, then you’re in for a big treat. It’s Fincher’s best to date! I love this film! It’s definitely one of the ones I could watch over and over again, and I actually think it’s one of the best films I’ve ever seen in terms of technicality, cinematography and writing. I agree, Christie. It looks gorgeous and is put together perfectly. There is nothing I can critisize about this film. Thank you, Rowena. And don’t forget to turn the oven off at 21:45; otherwise the cake will be spoilt. See, dear Readers, we’re here for all kinds of reminders at Wonderful Cinema! WARNING: STRONG SPOILERS IN THESE COMMENTS! I haven’t read the site in a while but I remember reading here http://www.zodiackillerfacts.com/movie.htm about the David Fincher Zodiac movie and ever since, I just can’t bring myself to enjoy the film the same anymore, even though I have seen it many times and always enjoyed it (up until I read the Fact vs Fincher breakdown). Honoured to have you stop by and comment. Funnily enough, I have read the same material and I thought it was also going to ruin my experience of revisiting this film. Luckily, I can still enjoy it for what it is – a detailed piecing-together of several directions an investigation lead. The mystery remains and the film is even more inconclusive than originally intended. And there still is that feeling that… you just never know. Keep writing! And do please pop back now and then. Great to have you thoughts. Thank you! (P.S. Sorry – I should have put ‘spolier alert’ in my comment but I forgot like a fool!) It is a great film despite the innaccuracies held up by the makers of the website. I suppose it’s like a lot of films made about serial killers – utter rubbish factually but still great films. It’s just that in today’s world where the TV is reality… …Paddy Chayefsky said it all in ‘Network’. I must watch Network (1976) again. I saw it when I was young and I’m sure I didn’t fully appreciate all the commentaries. I completely agree … about both films. Ah, a like-minded soul. Thank you, Renae! Speaking about serial killer movies Seven set the bar high. I didn’t know about Zodiac, so many thanks for the recommendation. I will watch it soon! Jorge, they are both made by the same director! Yes, it is such a shame American audiences demand remakes. A completely pointless and extremely rude exercise in my opinion.